What is Compliance & Enforcement (C&E), what is Chain of Responsibility (CoR) are they different or are they the same? Let’s dispel some myths; CoR is an alternate term for C&E, so why do we have different names? Effectively the “Chain” in CoR explains how the legislation impacts industry. Effectively the “Chain” implies that if one link of the chain is affected then all the links in the chain are affected. As such, no longer is a driver out on their own if they have a road law breach, there is now a connection through the chain to all people along the chain that had some influence over the driver and the load carried. Basically, what reasonable steps did all the parties in the chain do to ensure that the load and driver were legal on our roads? From the diagram you can see that if the driver defaults and ends up with a road law breach, effectively all those in the chain right through to the Director level can be held accountable for any action of the driver and they will be required to show they have taken Reasonable Steps to ensure the driver did not breach road law. But it does not stop there; other parties that are involved in the chain are also implicated. As a transport company you are affected, but the company you are carrying goods for can also be implicated. Even their suppliers could become part of the chain. 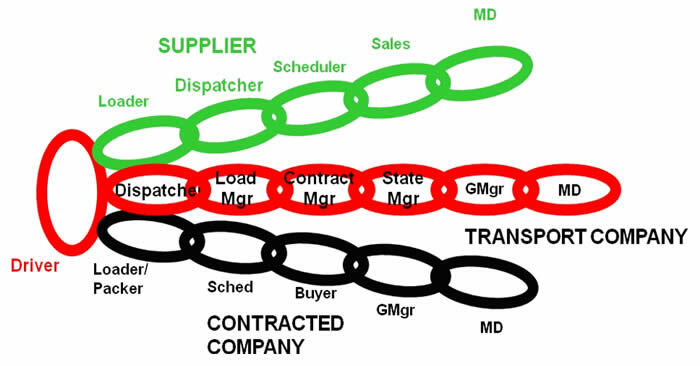 For example, if you are contracted to carry goods for a large company both in and out of a site, you as a transport company are part of the chain, the company you are contracted to are part of the chain for goods they despatch from the site, but also goods they organise to bring into the site. In addition, those who supply goods to that site are also part of the chain. So, this means that every role within the chain has a responsibility to ensure that road law breaches do not occur. Companies that fail to take reasonable steps to ensure that breaches do not occur, could face hefty fines in the future. In addition, corporate managers could face personal fines for failing in this area. Effectively C&E/CoR is “umbrella” legislation that encompasses road rules in its own State, for example, fatigue; maximum work hours in NSW & Victoria are only 15, in Queensland its 16 and in WA 17. Although the hours differ from State to State the C&E/CoR legislation takes into account these variations. As such because the hours vary it does not mean the impact of breaching State fatigue hours does. So what areas are covered under C&E/CoR? Do you have a Policy that covers “X” – show me? Do you have Procedure that covers “X” – show me? Have you implemented that P&P for “X” – show me? Have you implemented Active Education for CoR – show me? Can you provide demonstrable documentary evidence of what you have done in 1, 2, 3 & 4 – show me? This line of questioning is viewed as somewhat alien to the transport and logistics industry, as we are mainly “doers” and just get on with what we need to do to service a customer. Policies, procedures, training and particularly documentation is often low on our priority list. Backs of envelopes and hands, “Post It” notes and white boards are primary documentation sources and will not fulfil the requirements of C&E/CoR. The next critical aspect of this is; are your customers and suppliers able to do the same? They are a part of your chain as much as you are of theirs. What have you got in place to ensure they are doing the right thing by you? Where are you now and where should you be? Because C&E/CoR is new to WA, not all businesses know where they sit in relation to the legislation and what they need to do to be compliant. I know of companies that have spent significant amounts of money ensuring they are legally compliant with the law and set up elaborate contracts to protect themselves. There are others that have a “mate” who has C&E/CoR compliance and copied their manual with some new logos on it, assuming they will be compliant, NOT THE CASE. Can you do it all? Do you know where to start? How much do you have to do? Will it be compliant when finished? So is all this daunting? Rather than spend money on a shotgun approach to C&E/CoR, get a “Gap analysis” conducted by Logistics Bureau, then you will know what needs to be done, to what level and when.